To look at Maurice Lacroix watches, you’d think they were the work of a century-old legendary watchmaking company. Despite appearances, this Swiss manufacturer is only a few decades old, having been founded in 1975. Don’t be fooled by the company’s brief history, however; Maurice Lacroix watches are well made, quite attractive, and offer a variety of traditional and modern styles for both men and women. These watches are a luxury product, so they are not inexpensive, but they do have a rather broad price range, making their watches affordable for a large group of consumers. If you like old-school watchmaking, you’ll like this brand. 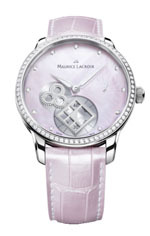 Read on for the full Maurice Laxroix watches review. The build quality is quite good; the company uses stainless steel and gold in their cases, and rock-hard, scratch-resistant sapphire crystal to protect the watch face. Bands are either stainless steel, gold, or leather, depending on the model, and water resistance ranges from 50 meters to 100 meters for most models. While this is not extraordinary water resistance, these watches are mostly fashion timepieces, rather than sports models, so you’re not likely to be wearing them in the water. With proper care, you’ll find that these watches should last for many years. These watches feature both mechanical and quartz movements. Their higher end models, including their famous Masterpiece line, use automatic movements exclusively, while their lower-end models tend to use quartz. Both are Swiss-made and are highly reliable; some of their Masterpiece models use vintage movements that are no longer manufactured. These were acquired many years ago and are now being put to interesting use. Repurposing older movements is certainly innovative, and you’ll find that the brand also includes mechanical complications and interesting styling. While the company isn’t at the forefront of watchmaking technology, they do keep up with what other manufacturers are doing and their current models are precise and reliable, with up to 50 hours of power reserve on their automatic movement models. The styling and features of Maurice Lacroix watches are interesting as the company offers a mixture of reserved, traditional styling as well as modern, avant garde looks. Models come in men’s and women’s versions, and cases are available in steel and gold. If you like diamonds, that’s an option for you, and if you like unusual faces, strangely-shaped dials, and things located in unusual positions, you’ll find the line to be rather fascinating. These watches are best suited to business and evening wear, but they’re so attractive that you may want to wear yours on a daily basis. Care and maintenance will vary, depending on the model. Quartz models will need to have the battery replaced every two years or so; you’ll be able to tell that the battery is wearing down when the second hand starts advancing only every four seconds, rather than every second. 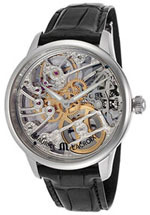 Maurice Lacroix watches with mechanical movements will need to be serviced every 4-6 years; this involves returning the watch to the manufacturer. They will disassemble it, clean it, replace worn parts, lubricate it, test it for both water resistance and accuracy and polish it up so it looks as good as new. Aside from these considerations, you should store your watch in a cool, dry place and keep them away from extremes of temperature and strong magnetic fields. Automatic models should be stored in a watch winder to keep them running properly. With proper care, you’ll find that these watches will run well for decades, if not longer. The warranty is the industry average – two years from the date of purchase against defects in materials and craftsmanship. These are thoroughly tested precision timepieces, so defects should be quite rare. You’ll find that prices are fairly typical of high end luxury watches. Models start at about $1200 or so and at the high end, are priced at about $15,000. Most models fall in the middle of that range, but those with diamonds, gold, or models that are limited in production, such as the Masterpiece series, will be priced higher. Collectors like the brand, so there’s good retention of value and even appreciation for some models. This is surprising; most collectors aren’t interested in brands that are relatively new and instead gravitate towards older, more established brands. Look for this brand to appreciate even more in the years to come. Like many luxury watchmakers, the manufacturer tries to control distribution and pricing of their products in order to keep demand ahead of supply. This notion of scarcity keeps their products in demand and expensive. As such, you can officially only through authorized dealers, of which there are relatively few. There are only six or so in the United States, for example and all of these are located in large cities. Unofficially, there are a number of dealers online who sell the brand, and they represent your best opportunity to buy at a discount. Keep in mind that even authorized dealers are unlikely to stock the entire product line, but most should have a good representative sample. For a relatively new watchmaker, the companyhas done a great job of establishing their brand by offering high quality timepieces that look and feel as though they were made by 19th century artisans. 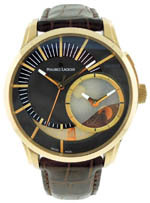 The watches are attractive, offer nice features, and present a good selection of models for both men and women. They aren’t inexpensive, but they are sure to draw attention wherever they are worn. If you’re looking for a well made modern timepiece with old-world style, you should definitely consider Maurice Lacroix watches.